Use this registration if you are an active, paid ASCGWA member for the 2018-2019 club year. ASCGWA members will be allowed to add additional guests as part of their registration. Use this registration if you have paid for a PERMANENT Reservation for yourself and want to pay for a guest to attend. Hello Everyone! You won't want to miss voting for our 2019-2020 Executive Board at our April Luncheon. Register today! The position of Treasurer is open at the moment. Please contact Amy, our Parliamentarian, if you or someone you know is interested in joining next year's amazing team by filling this position. parliamentarian@armyspousesclub.org. 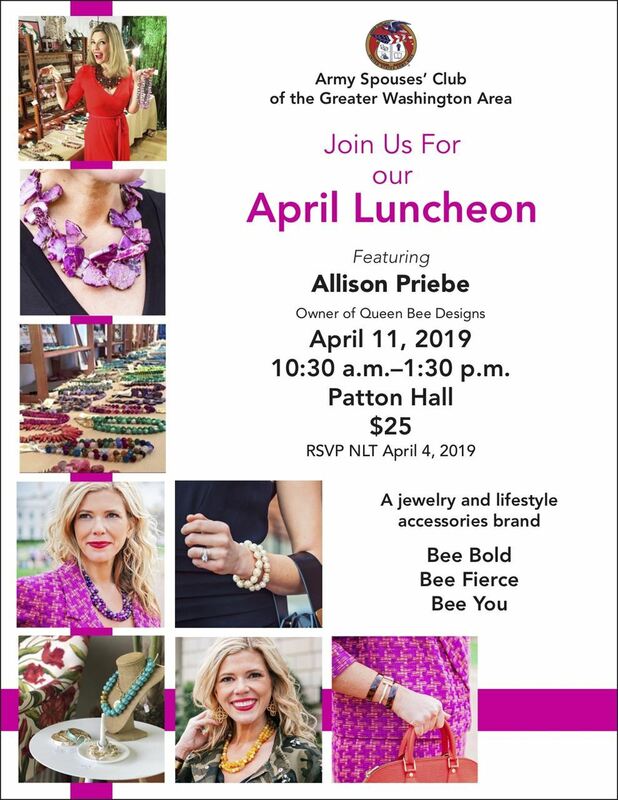 Click on the flyer and read below for more information on our Luncheon Speaker, Annual Plant Sale and Charitable Cause. Guests are always welcome! Our Charitable Cause for April is the Fort Myer Library's Summer Reading Program. Click HERE for more information about much needed donations. For our Annual Plant Sale, we are once again partnering with GreenStreet Growers. Get ready to add some color to your porches and gardens with beautiful hanging flower baskets and flowering plants which also make wonderful Easter gifts! All proceeds will benefit the ASCGWA Scholarship funds. More information about the plant sale HERE.